Over the last four days the Broncos have had three days of practice and one day off. Here are some notes and interesting points from each day. Several former Broncos took in the team’s practice as Tom Jackson and Brian Dawkins visited Dove Valley, while Karl Mecklenburg helped coach for the second day in a row. Broncos Owner Pat Bowlen visited with Mecklenburg and Jackson on the field before practice began. Guard Chris Kuper continued to rotate with Manny Ramirez at right guard as Kuper recovers from his late-season injury last year. Safety Quinton Carter (hamstring), defensive end Jamie Blatnick (ankle) and tackle Orlando Franklin (slight concussion) did not practice today. Defensive tackle Justin Bannan left practice with a strained calf and did not return. Tackle Chris Clark played right tackle with the first team in place of Franklin. Defensive linemen Derek Wolfe and Ben Garland both got work at defensive end and defensive tackle on Sunday. Coaches continued to mix players in with different groups throughout the session. Cornerback Chris Harris saw some time with the first nickel defense and Rahim Moore spent most of the afternoon playing with the first base defense. Linebacker Wesley Woodyard saw time with the ones and twos. At quarterback, almost every drill had a different order of appearance as to who followed Peyton Manning. Jacob Tamme turned in the highlight grab of the session with a one-handed, over-the-shoulder catch on a pass from Manning. After the play, linebacker Danny Trevathan, who was in coverage, just shook his head in amazement as he walked back to the sideline. Wide receiver Jason Hill also came up with a one-handed snag on a bullet from quarterback Brock Osweiler in the back corner of the end zone. During team drills, defensive linemen Kevin Vickerson and Jason Hunter each leaped in the air to bat down passes from quarterbacks Adam Weber and Caleb Hanie, respectively. No one is allowed to hit the quarterbacks during practice, but defensive end Cyril Obiozor was in position for a pair of sacks during team drills. During red zone drills, Hanie was forced to throw the ball away and in doing so hit the crossbar. As the ball deflected into the air and back towards the playing field, Moore turned around and made a diving catch that drew a big cheer from the defense as well as the fans. For the third straight day, the Broncos ran onto the practice fields at Dove Valley wearing full pads. And for the third straight day, the team had a fast, physical, productive practice. Safety Quinton Carter (knee) and tackle Orlando Franklin (concussion) did not participate in Monday’s practice. Defensive tackle Justin Bannan (calf) was on the field for the session, but was just observing in shorts and his jersey. Cornerback Joshua Moore left practice with a right hamstring injury. Cornerback Omar Bolden got "dinged," Head Coach John Fox said, and the team will evaluate him. Defensive end Jamie Blatnick (ankle) practiced for the first time during camp. Chris Kuper continued taking more and more reps with the first-unit offensive line. For the majority of practice, he was in at right guard. During one-on-ones between receivers and cornerbacks, quarterback Peyton Manning found Stokley for two quick catches. When the offense switched to 7-on-7s, Manning found Stokley two more times back-to-back, including a diving catch on the sideline that garnered more cheers. His other notable catch of the day came during team drills. Manning dropped back and was immediately under pressure as the defense came with a blitz. The veteran quarterback got the ball away, sending it directly into Stokley’s arms in the end zone for a touchdown — much to the delight of the crowd, and the rest of the offense. Wide receiver Tyler Grisham had a nice practice — starting during the first team drill, when quarterback Brock Osweiler evaded pressure in the pocket and fired a completion to the second-year receiver out of Clemson. Later, during one-on-ones, Grisham had arguably the catch of the day on a ball thrown by quarterback Adam Weber. He reeled it in over his shoulder as he slid down into the end zone. On Manning’s second throw of one-on-ones between WRs and CBs, he pump faked to Decker, who ran a double-move and found himself streaking toward the end zone. Manning let the pass fly — but it fell through Decker’s hands at about the 5-yard line. The receiver was visibly angry at himself, but quickly made up for the error. During team drills, Manning dropped back and fired a deep pass down the middle of the field toward Decker. The third-year receiver hauled it in between Porter and safety Rahim Moore for a huge gain, drawing the loudest cheers of the day from the crowd. Cornerback Syd’Quan Thompson stood out for a couple of pass breakups, one on a big hit during one-on-ones, and another during 7-on-7s, when he batted away a pass that brought on praise from Defensive Coordinator Jack Del Rio. Quarterback Brock Osweiler found Caldwell for back-to-back completions during team drills, one of which went for a touchdown. The rookie showed his appreciation by running to meet the receiver on his way back to the huddle, giving him a slap on the rear end. Several players worked with Assistant Special Teams Coach Keith Burns on downing punts inside the 10-yard line. First, Burns threw a football high in the air, and two players would make sure it was corralled inside the 10. Next, he rolled a soccer ball from the 5-yard line, and players had to sprint and tap the ball back away from the end zone before a touchback was called. Later in practice, he bounced the soccer ball at the 1-yard line, and one player’s job was to leap and tip it away from the end zone while another caught it inside the 5. One of the more entertaining, back-and-forth exchanges of the drill came in the matchup between defensive end Cyril Obiozor and tackle Adam Grant. On the first attempt, Grant kept Obiozor in check, but the coaches asked for a redo. On the second attempt, Obiozor won handily, putting both hands on the “quarterback” for a sack. Right away, the two lined up for a third attempt, and this time Grant gave Obiozor a hard shove at the point of impact, knocking the end back and giving the win to the offensive line. Thompson, Porter, Drayton Florence and Tony Carter all took reps fielding punts. After a two hour and 40-minute full-contact practice this morning, the atmosphere during the evening session was far more laid-back, with players wearing just their jerseys, shorts, cleats and an assortment of hats and visors. Defensive tackle Sealver Siliga played catch with his fellow defensive linemen before practice started, and even tried out a punt. It’s safe to say there’s no controversy brewing over any competition between Siliga and incumbent punter Britton Colquitt. Running back Willis McGahee wore a dark blue Broncos bucket hat, and with no fans and only a few members of the media present, the intensity was substantially lower than it was during the morning session. Linebacker Von Miller wore neon green socks again and his signature glasses. He patted the football and simulated a drop-back, as if he was a quarterback, between plays during the walkthrough. The Broncos had the day off. A forecast of inclement weather forced the Broncos to cancel Wednesday’s public practice and move the session up a few hours. The media-only practice ended just in time, as a torrential downpour began just as Head Coach John Fox blew his whistle to signal the end of the session. Safety Quinton Carter (hamstring and knee), tackle Orlando Franklin (concussion) and cornerback Joshua Moore (hamstring) did not participate in practice. Fox said that during practice, wide receiver Eric Decker strained his groin, running back Ronnie Hillman injured his hamstring and wide receivers D’Andre Goodwin and Greg Orton suffered ankle injuries. One of the first drills of practice involved one linebacker acting as a ball carrier as another lined up him for a big hit. Assistant Secondary Coach Sam Garnes oversaw the drill and didn’t like what he saw in the first few reps. "I haven’t heard a pop yet!" he shouted. 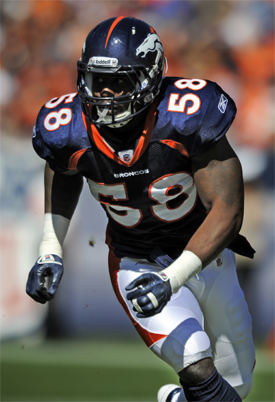 Then Von Miller ran through the drill and delivered a nice pad-popping hit, which drew a, "Yes sir, five-eight!" from Garnes. During one-on-ones between offensive and defensive linemen, defensive end Jason Hunter had the standout rep, flattening tackle Adam Grant en route to the backfield. That drew some cheers of "Woo!" from his fellow D-linemen. On the offensive side, guard Chris Kuper impressed in his reps.
On one of the running plays in the 9-on-7 drill, Hillman found a hole in the defense and bursted through it, only to get thrown to the ground by linebacker Wesley Woodyard. Manning’s chemistry with wide receiver Brandon Stokley continued to show itself on Wednesday, as the veteran ran a crisp route to get past cornerback Tracy Porter deep for a touchdown during one-on-ones. Running back Xavier Omon had a nice run during 9-on-7s, bursting into the secondary and laying a hit on new safety Anthony Perkins. Moreno met Omon on his way back to the sideline with a hard high five. Two other standout plays from team drills included a nice run up the middle of the line by Mario Fannin, and a breakup by cornerback Champ Bailey, when he sprinted to swat a Manning pass out of the hands of wide receiver Andre Caldwell. Broncos owner Pat Bowlen watched portions of practice from the sideline. During the 9-on-7 drill, rookie defensive end Malik Jackson also lined up inside at tackle. Jason Hunter saw some first-unit reps at defensive end during that drill as well as full-team drills. 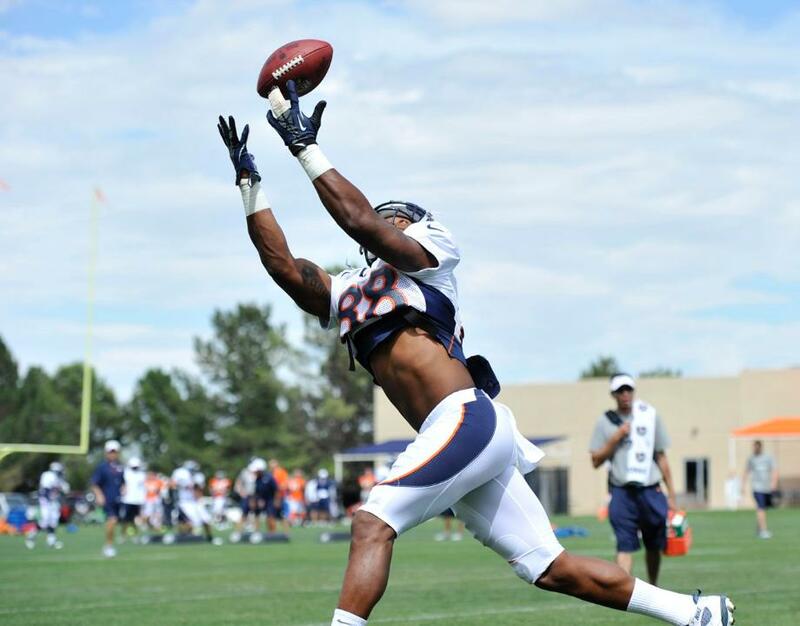 The Denver Broncos announced that they have acquired Wide Receiver Cameron Kenney off waivers this afternoon. The 6-0, 199 lb. first year player out of Oklahoma formerly played for the Seattle Seahawks. Cameron signed with the Chargers following the 2011 NFL Draft. This is a great set of videos about last year up to this point. That is it for the next few days, enjoy ~ Aussie. I heard Ryan Harris was replacing Franklin. You said it was Clark. Are you sure, because I was excited to see Harris' back is doing well enough for him to be backup RT. Syd seems to be doing good enough to make the team. 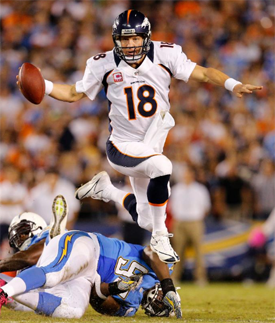 Tamme and Stokley also seem like hot targets for Manning. Familiarity probably has something to do with it. Both have been rotating through Frnaklin's spot. Clark was the first to get a go then Harris took over. Harris I believe has been playing better there. 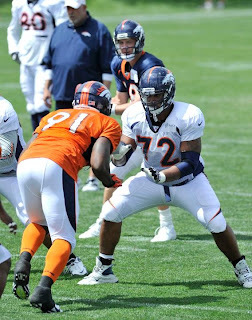 Though I did see a photo from todays practice where it looks like Harris is playing LT with the twos. Either way at this point in time they are still rotating and experimenting with positions. And I agree, but Thomas tore it up today. Manning will spread it around. Actually I even have a photo of it in this post. Harris (72) is playing LT against Ayers with what I would believe is the ones. 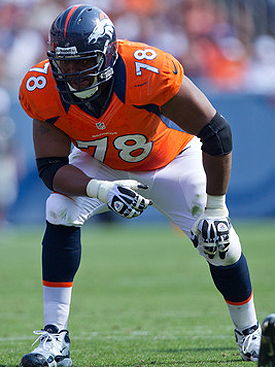 There is this too at IAOFM, "while Ryan Harris continues to work as a backup tackle. According to Andrew Mason's report, Harris isn't considered to be competing for a starting job." 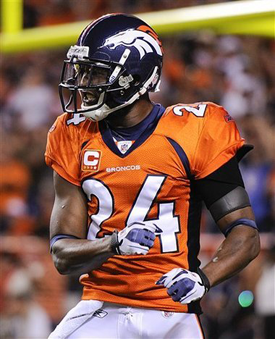 Welcome to Broncos Blog where we consider the Broncos to be Best. Broncos Blog is a small group of devoted Broncos enthusiasts that want to share their perspective on current news, events and information about our first love, the Denver Broncos. We are a fun loving group and like to share a laugh. If you are interested in joining the community all you need to do is start following and then jump in. Go Broncos! "I am a broncos fan, and I believe. I believe in Mile High Magic, and bleed Orange and Blue. 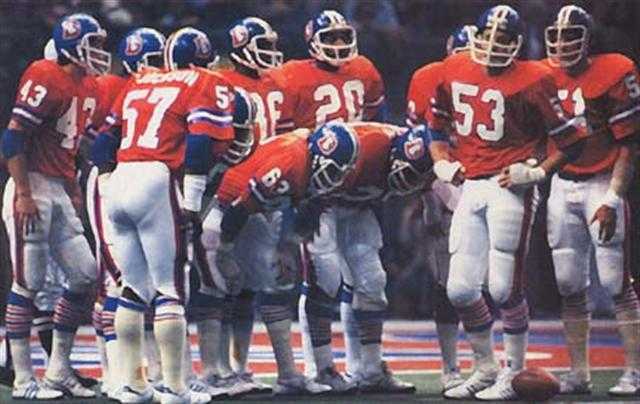 I celebrate the Orange Crush, The Drive, & the Mile High Salute. I create the Thunder, share the common dream & will forever be a proud citizen of Broncos Country." Who is going to win the Superbowl? Torain, Hillis, and Princess chillin at fan fair.